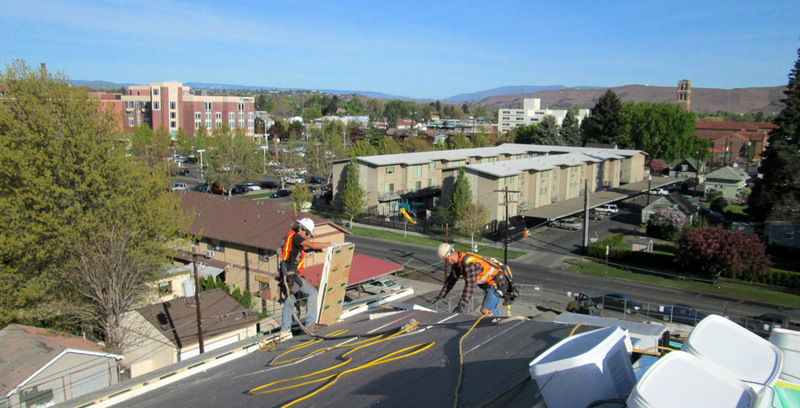 Wagner Roofing has installed nearly every roofing system that is available: single-ply roofing - TPO. PVC, EPDM, built-up roofing - BUR, SBS. APP, concrete tile and laminate shingles. We are proud to offer waterproofing and coating services, from simple footing/foundation waterproofing and drainage systems to very high-scale subgrade and patio/pedestrian surfacing such as Kemper and American HydroTech. We also offer coating systems that can preserve or extend the life of almost any existing roof system - whether it be metal, SPF, single-ply or BUR. We are very dedicated to keeping up with the most current and advanced roofing products and application methods, and continue to invest in equipment and training to offer our customers the best products and systems available. We also have access to other related services, such as infrared studies/moisture surveys and deck/substrate pull-out tests. We have had the privilege of completing multiple projects for such prestigious firms as Stemilt Growers, Noel Canning, Shields Bag & Printing, Energy Northwest, Memorial Hospital and Tree Top. We have also completed successful projects for almost all of the School Districts in Central Washington. We pride ourselves on providing a safe working environment for our crews and customers, and even employ the services of an indepoendent safety consulatant to ensure this. We have a very siginificant bonding capacity for any project that should require such. we can also access technical assistance and advice for our customers.